Hey presto, its pesto! This vegan pesto is the besto, forget about the resto! 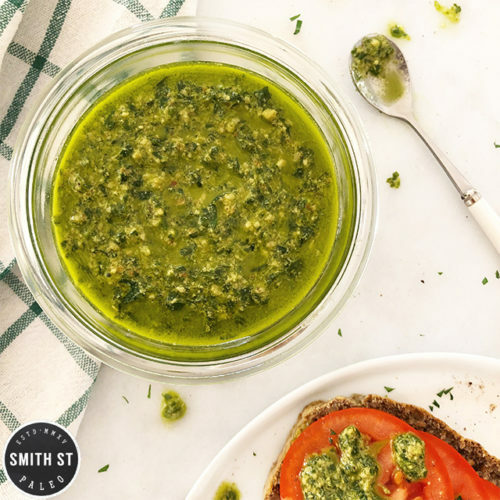 Pesto seems to be a little old hat these days, with all the hipster cafes saying bye bye to Italy and heading further afield to find condiments to zhoosh up their toasties and breakfast bowls (enter stage left zhoug, harissa & ajvar). But I stand firm on thinking it should be in everyone’s fridge, because it’s tasty and versatile. I’m sure plenty of nonnas out there would freak out by my suggestion of using anything but the traditional ingredients, but let’s just assume they’re deaf or too busy making you feel guilty about not visiting them enough to pass comment on this cheese-less jar of green goodness. Put the rocket, basil, garlic and walnuts in your food processor and pulse a few times to start breaking them down. Add all the other ingredients and pulse together. You may need to scrape down the sides a couple of times. Keep whizzing until you get the desired consistency. You don’t want it super smooth, leave some texture. This stuff keeps in the fridge in an airtight jar for a week or so. How to use it?